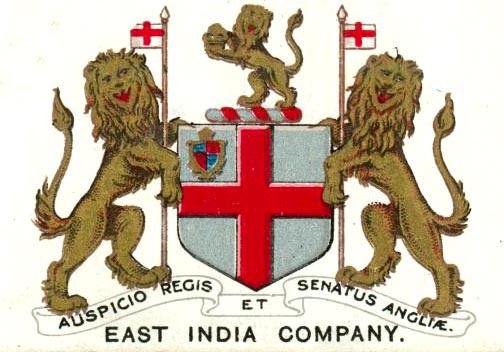 Above: Arms of the British East India Company. This image comes from a Will's cigarettes card in the collection of the New York Public Library. 'The Governor and Company of Merchants of London Trading into the East Indies' were a group of merchants who banded together to gain a slice of the lucrative spice trade in the 1600s. Granted a monopoly of the English trade with the area, ships set off with goods to exchange - woollen cloth was one of these commodities. Over time the merchants set up trading posts with the consent of the local rulers. In India three towns in particular - Bombay, Madra and Calcutta, grew in size, eventually becoming 'Presidencies'. By the mid 1700s the huge profits that the company made had transformed it from a trading concern to a ruler, a law unto itself. However, it faced power struggles with regions outside its control, and competition from other countries, notably the French and the Dutch. In spite of its wealth it struggled with the amount it had to pay for a military presence to preserve its interests. The British government took a keen interest in the activites of such a powerful concern, and in 1773 Lord North's India Bill gave parliament greater control over the affairs of the Company. It lost its monopoly in 1833, and after the Indian Rebellion of 1857 the Crown took over complete power. 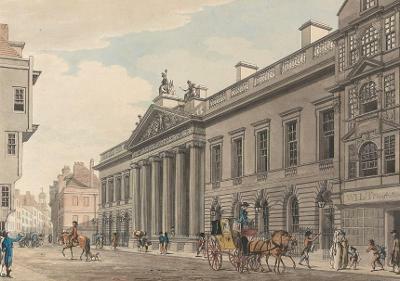 Above: East India House, the London headquarters of the East India Company. 'In 1787 295,311 pieces (of woollen cloth) were exported from Exeter. In 1789, the East India trade being then increasing, 121,000 pieces were bought by the East India company alone. These were of the sort of serges called Sandfords, except 600 pieces of broads made at Crediton; the others were made mostly at Ashburton, Tavistock, Modbury, North Tawton and Newton Bushel. The East India company, whilst they had the monopoly of the tea trade, were enabled to force these pieces of serge or long ells, on the Chinese in exchange; and it is believed, by some of the Devonshire manufacturers, that they were induced to do this at the request of the executive government, in order to relieve the great and sudden distress in which the weavers and manufacturers of Devonshire had previously been involved. From 1795 to 1805 the company annually purchased from 250,000 to 300,000 pieces. 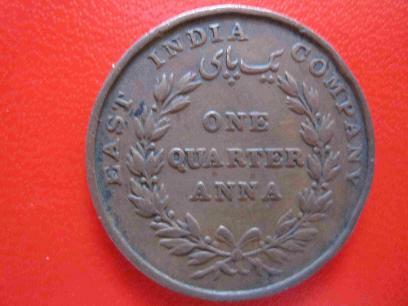 Above and above right: The East India Company had its own currency. In 1846 serge manufacturers sent a petition (or 'memorial') to the Lords of the Committee of Privy Council. Trade had suffered ever since the breaking of the East India Company's monopoly* - the petitioners were looking for support. Hoping for trade with China, the manufacturers implored their lordships to reduce the tax on tea, to encourage a two-way flow of goods. There are numerous accounts of Robert Palk, and most of them agree, but I have to say that so far I have found little independent evidence of his early life and career. I have added to traditional accounts where I can. Robert was allegedly baptised 16 December 1717, the son of Walter and Frances. His age at death (see below) would confirm this as his birth year. Frances the wife of Walter Palk was buried 30th July 1740. Robert Abraham, his mother's brother and Robert's godfather, is said to have sponsored Robert to attend Wadham College, Oxford after an education at Ashburton Grammar School. Robert Palk, Serviens April 1736, fil Gaulteri P. de Ashburton: pleb set 18. The above means that Robert was the son of Walter Palk of Ashburton; and possibly (I am not sure) that he had to do menial tasks at the University to work his way through. After graduating in 1739, accounts say that Palk was ordained as a deacon at Exeter Cathedral by Bishop Weston. He then held curacies at Egloskerry and Launcells. He then apparently went to London in 1741, attracted the favour of Robert Walpole, and was sent to India. 1742 The National Archives holds warrants or commissions for various ranks in the Royal Navy for the following: Reverend Robert Graham, Chaplain; The Hon. Edward Boscawen, Captain; Robert Heager, boatswain; Thomas Lempriere, 3rd Lieutenant; George Mackenzie, 1st Lieutenant; Richard Morgan, gunner; Reverend Robert Palk, Chaplain; Arthur Pigstock, boatswain. Five years later, in 1747, he was appointed naval chaplain to Edward Boscawen on the Namura, arriving in . Fort St David in 1748, at time when French were in control of Fort St George in Madras. 1749 The chaplain at Fort St David, Francis Fordyce, publically insulted Robert Clive and was dismissed. Robert Palk took his place, but this led to some disagreements with other clergy over his seniority. At one point he intended to resign his chaplaincy and join the East India Company. The trade war between the French and the British escalated into an armed fight, and General Stringer Lawrence was given the task of forming an army. Robert Palk met Stringer Lawrence in 1751, and they were to become good friends (see Stringer Lawrence's will and the letter to the Gentleman's Magazine, 1792, below). A year later Robert was appointed as Paymaster and Commissary in the Field to Lawrence's army. 1754 saw Palk, with Henry Vansittart, discussing peace terms with the French. Through Stringer Lawrence he was achieving lucrative deals, and the directors of the company ordered him to confine himself to religious duties. Palk returned to England and renounced his vows. He was sent back to India in 1761, where he served on the Council of the Company, was a member of the treasury committee, and also served as Export Warehouse Keeper. Vansietart/Vansiltart in transcriptions by Berkshire FHS. In November 1763 Robert Palk succeeded George Pigot as Governor of Madras. 1767. Robert left India, aged 50, but continued to take a great interest in any matters concerning India and the East India Company. Stringer Lawrence made Robert Palk sole executor of his will. After some annuities to servants he left his 'godson Lawrence Palk the son of my very worthy friend Robert Palk of St James' Place, esq. my sword set with diamonds which was given to me by the East India Company* to be delivered to him when his said father shall think him of proper age to wear it and I give unto my godson Lawrence Palk all my plate to be delivered to him on the day of his marriage and I give and bequeath all the rest and the residue of my personal estate unto the said Robert Palk...and lastly I give and devise unto the said Robert Palk...all that messuage or tenement with the outhouses and buildings and lands and hereditaments situate lying and being in Southampton which I lately purchased of Mr Cox (?) and all other my real estate whatsoever. * This is probably the sword referred to in extracts from the minutes of the court of directors held in the National Archives, ref. IOR/H/455. It was worth £750 at the time. In 1782 Robert Palk was made a baronet, in recognition of his efforts in securing India for Britain. Palk Bay and Palk Straights, a stretch of sea between India and Sri Lanka, and the Palkonda Hills near Madras were all named after him. 'The Right Honourable John Sullivan of Ritchin's Park, Berks (MP for Ashburton, a Commissioner for the affairs of India, and brother-in-law by marriage to the Earl of Buckinghamshire) is brother to Sir Benjamin. A third brother was Richard-Joseph, who early in life was sent to Asia with his brother John, under the auspices of Laurence Sullivan, esq., FSA Chairman of the East India Company and MP first for Taunton, and afterwards for Ashburton. Peter Cranch, formerly of Ashburton, left a will that was proved in 1771. A member of the 79th Regiment of Foot, he was living in Batavia in the East Indies at the time of writing the will in 1764. When the will was proved Peter was described as being formerly a Lieutenant in the 79th Regiment, but later a captain in the service of the Honourable East India Co. on the coast of Coromandel. PROB 11/973, file reference: 82, records of the Prerogative Court of Canterbury. John Edmonds, son of John and Anne, was baptised on January 7th 1778 at Ashburton. The memorial stone below, on the wall of St Andrew's Church, says that John (Jnr) became a major in the East India Company and died in India in 1818. According to The New Monthly Magazine and Universal Register, below right, Ann, a sibling of John, married Col. John Hilley Symons of the E.I.C. 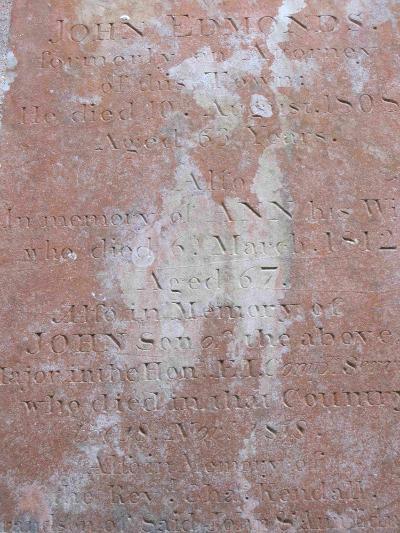 Above: 'John Edmonds, formerly an attorney of this town He died 10th August 1808 aged 63 years. 1817 At Stoodleigh, Col. John Hilley Symons, of the E.I.C's service, to Ann, eldest daughter of the late John Edmonds Esq. of Ashburton. Charles Kendall married Elizabeth Edmonds in January 1805. In 1840 Thomas Eales Rogers was one party named in connection with the lease of a dwelling house in Landrake, Cornwall. The Earl of Mount Edgcumbe is another. 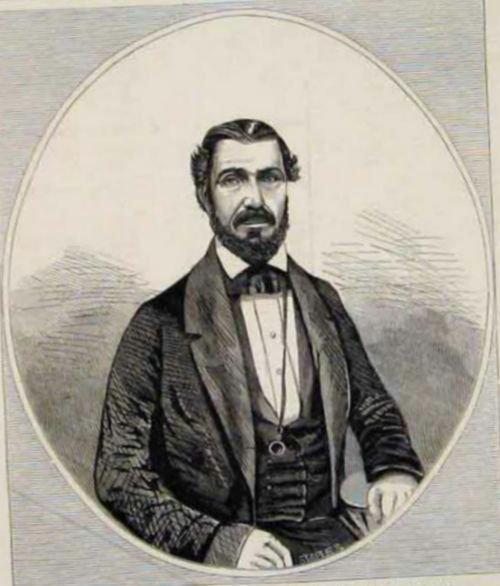 Thomas married 4 times, the first being to Emblyn Middleton in Calcutta, in 1845. They had two children: Emblyn Ellen, born in Calcutta in 1846, and Thomas Middleton, born in Alipore in 1847. After Emblyn (his wife)'s death he married again in 1852, this time to Sarah Coates, a widow. This marriage was also in Calcutta. John Eales Rogers was born in 1853, and a daughter, Sarah Jane, was born in Calcutta in 1854. 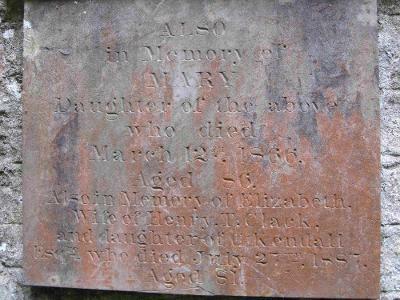 Sarah (the wife) died in 1855. In 1845 Thomas was a Master Attendant at Calcutta; by 1852 he was Superintendent of Marine. British India Office Ecclesiastical Returns, parish register transcripts from the Presidency of Bengal, ref N-1-68, folio 236 and ref N-1-81, folio 114. What was the Bengal marine? The East India Company had a navy to protect its assets at sea - for most of its history it was called the Bombay marine, before becoming the Indian Navy in 1830. Little has been written about the Bengal marine, but it appears to have been a smaller force operated by the company from the late 1600s to 1858. Above: 'Captain Rogers, Late superintendent of the Bengal Marine'. 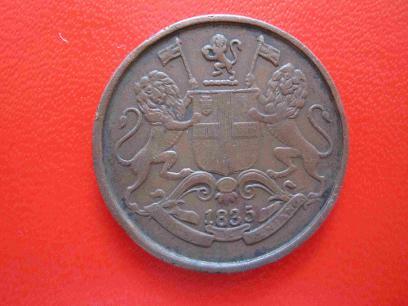 By 1859 Thomas was back in the UK: he married widow Mary Caunter in the Newton Abbot registration district in 1859. In February 1860 he became Captain of the 9th Devon Rifle Volunteers. In the 1861 census the couple are living at Waye, with Thomas's stepdaughter Grace Caunter, aged 35, his brother and two nieces. Thomas was born in Callington, Cornwall, and Mary was born in the East Indies. After Mary's death Thomas married Harriet Eliza Poingdestie or Poingdestre in Hampstead in 1870. They had a daughter, Mabel Milsom, born in 1871, and another daughter, Winifred Eales, born the following year. Both were baptised in Ashburton, with their father's occupation being given as 'Officer in the Indian Navy'. In 1874 Harriet Eliza is named on a document as the widow and executrix of Thomas Eales Rogers. 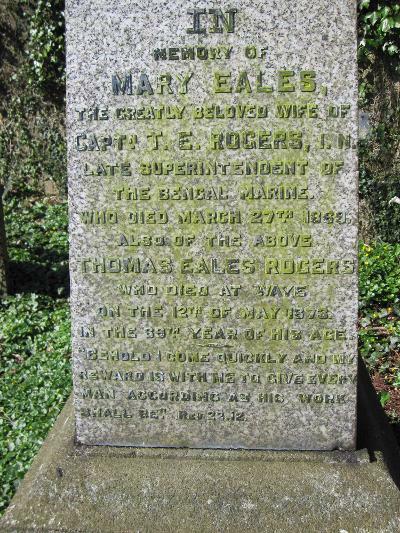 In his will Thomas left £3000 to his second son John Eales Rogers, with the rest of his estate going to Harriet.